I love Thai food, but unfortunately Thai food does not always love me. At a restaurant the other day, while sampling a delicious concoction of liver, cilantro, and mint, my insides began protesting, and I knew that I had to find a bathroom. Making hasty excuses to my dinner companions, I dashed out the door of the restaurant and around the corner to the public restroom. Alas and alack, when I opened the door of the blessed bathroom stall, I saw a troubling sight: no toilet paper. I checked all the stalls. None of them contained TP. 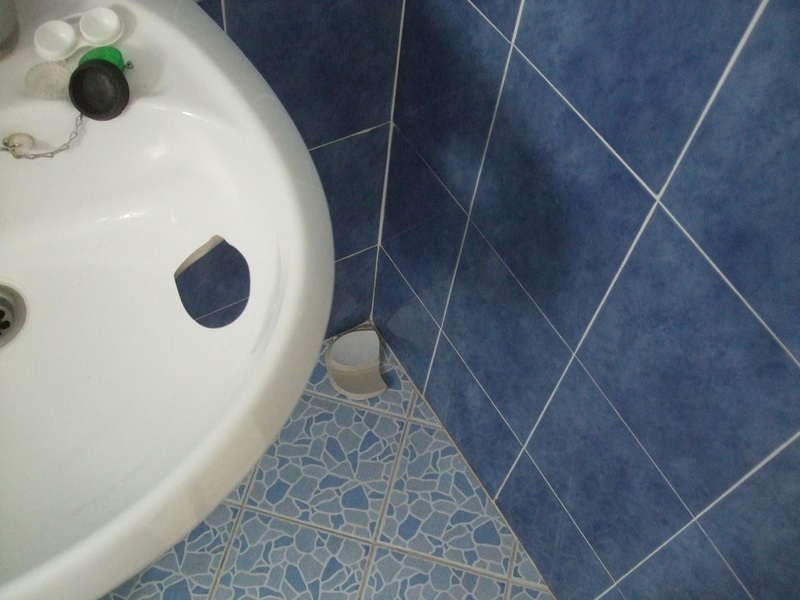 Many Thai bathrooms have little sprayers to use in lieu of toilet paper, but this bathroom didn’t even have those. I looked by the sinks, in the doorway, everywhere. No TP. Not even paper towels. Nothing that could reasonably substitute for toilet paper. And then I saw that the supply closet was unlocked. Joyfully, I thrust open the doors and went inside. But unlike other supply closets I’ve peeped into in my life, there were no neatly stacked rolls of toilet paper and paper towels. There was, instead, a couple shelves full of junk. Paint cans. Scraps of wood. There was a plastic TP dispenser, which gave me a brief moment of hope, but there was nothing inside it. I pawed through the shelves desperately as my insides rumbled and shook. And then, buried amidst the junk, I found something. A tiny packet of napkins. “That’ll do,” I said to myself. And it did. Just a hop, skip, and a jump from Amy’s house is North Chiang Mai University, the college where she teaches. I love hanging out there, because, well, you know. I love college, and I love Thailand, so obviously I am going to love a Thai college. Amy teaches English to some staff ladies. It is Tuesday, so they all wear pink polos. 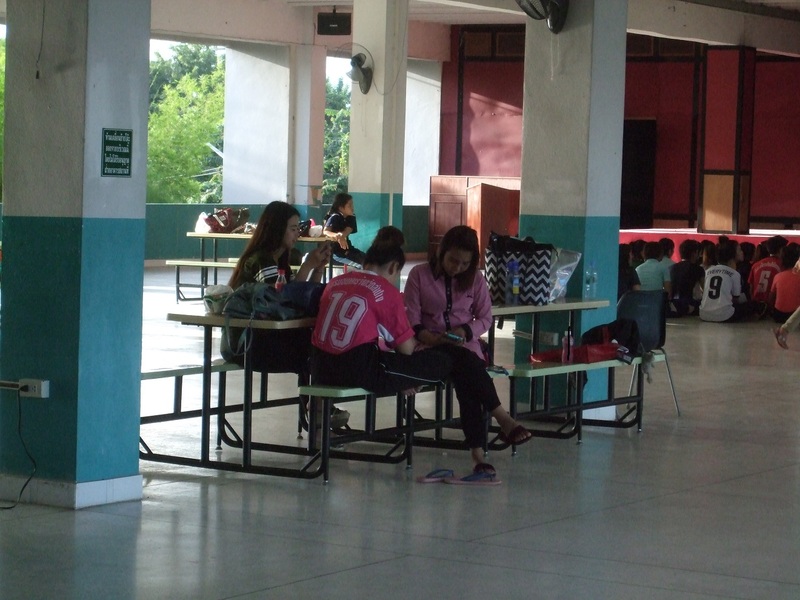 Another interesting thing: Thai students go to college a couple weeks before semester starts. 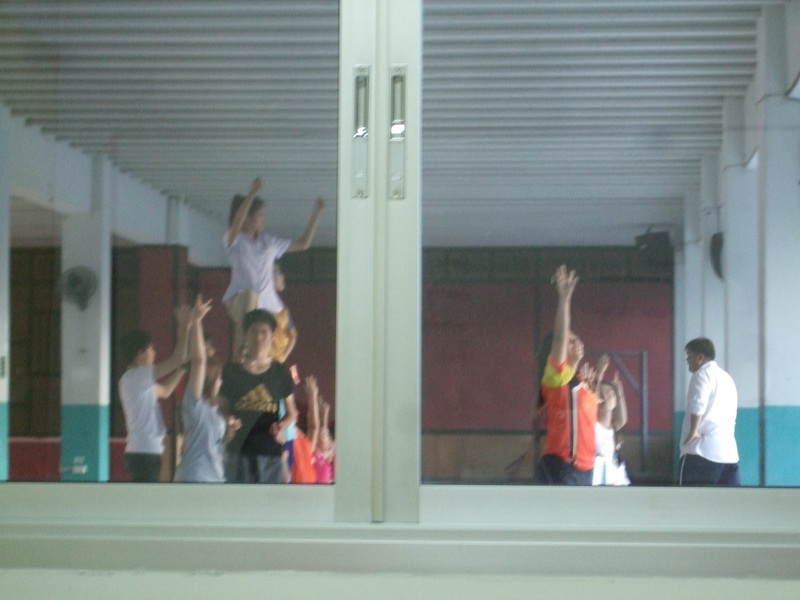 They do a lot of activities, including learning dances and chants that correspond with their major. One evening, Amy, Kim, and I were just leaving the university when we met a group of English majors on the landing. We started chatting about this and that, and then we began to ask them about their dances and chants. “Yes yes! Ahhhhhhhhhhhhhhhhh Boom! E-E-ENG-ENGLISH!” And on in a similar fashion. They laughed. We laughed. Everybody laughed. Amy and I hadn’t eaten supper yet. “Are you hungry?” Amy chanted. “Yes yes boom!” I said. For some reason we all found that really funny. One morning, Amy and her roommate Kim were at a staff meeting, so I decided to be helpful and do some housecleaning. I sprayed the mirror and began to wipe it. Unfortunately, the mirror pivoted at my touch, and knocked the glass of toothbrushes off the little shelf, and into the sink. I braced myself as I heard the sound of something breaking. I was afraid I had shattered the glass completely. But no, it was no worse off than it had been before. There was a hole in the sink. It struck me as comical. Just a hole, poking straight through the sink. Then I sobered up. What would Amy and her roommate Kim think of me breaking their sink? Oh dear. I took the chunk that had broken off, and put it on the table. Then I waited for them to get home. A bit later I heard someone, so I went into the living room and saw that Kim had returned. She was studying the chunk of ceramic. “Yes, I broke the sink,” I confessed. I led her into the bathroom and showed her the damage. She took one look at the hole in the sink, and began to laugh. She laughed and laughed, wild gales of laughter. I laughed too. I couldn’t help it. Going to restaurants—even some place like Taco Bell—is a treat for me. You can save a lot of money by packing your own lunch. But here in Thailand it isn’t like that. 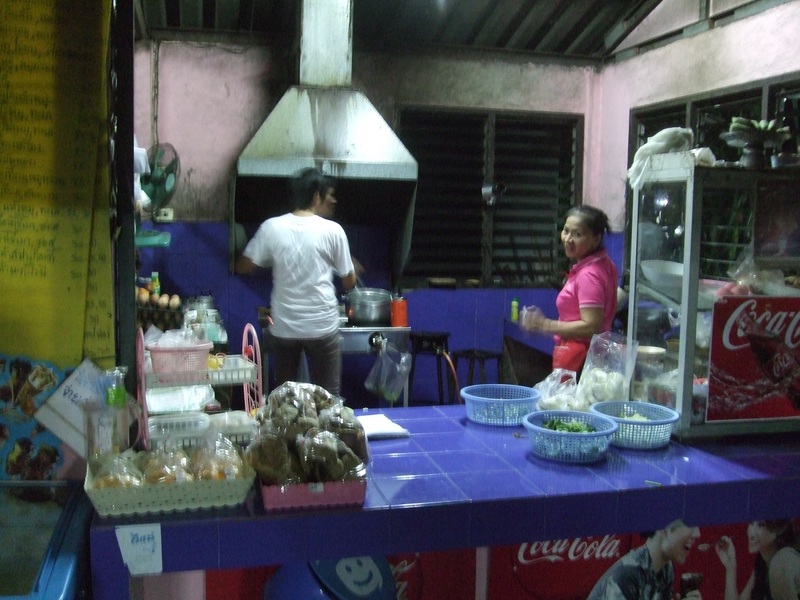 There are little restaurants here, there, everywhere, selling meals for $0.78, or $0.93, or sometimes $1.09 if you are eating a more expensive kind of meat. We often eat out twice a day. The food is a wondrous array of flavors. It usually consists of some kind of savory meat over rice or noodles. And vegetables. Oh my! Carrots and green beans and onions and cabbage and many others I don’t recognize, all fried up with the rest of the dish. But they don’t put sweet corn in the dishes. That, Amy tells me, is a desert around here. We passed a Dairy Queen and she showed me the sign. They were selling a corn sundae. Right down the street from Amy’s house is the restaurant we visit most often. “Kitchen at the Edge of the North,” it is called. (The “North” bit refers to North Chiang Mai University, where Amy teaches.) We frequently run into people we know, there. Neighbors and college kids. The cooks in the Kitchen at the Edge of the North. It is an open-air restaurant and the stray cats of the village wander in and out. One day, two of them got in a cat fight. It was a real doozy. The fur was literally flying-gray tufts floating in the air. The cook whirled around in surprise and charged at them, trying to break up the fight. Chunks of meat flew off of her spoon. Amy and I laughed and laughed. I am going to miss this when I go home. I am tasting flavors I never even dreamed of. This entry was posted in Travel and tagged broken sinks, food, Thailand, The Kitchen at the Edge of the North, university. Bookmark the permalink. It’s little things like this that make traveling such fun. Thanks for sharing! I laughed too. And: how bizarre is this: In Thailand they have corn ice cream at Dairy Queen. And in Kenya the guy with the cooler was selling Corn Ice Cream. Remember? Ha ha I forgot about that!